I’ve been wearing it daily for the last week since the weather here in Kamloops turned cold, the high daily temperatures are sometimes as high as freezing temperature. Not until this morning, looking at its soft curvy shape under the morning light that I saw much more than object. She knitted this scarf for me sometime around 2008 or 2009, using the classic stitch she used when she made those fisherman sweaters I wore as a kid. The ones she made looked like that photo, there was some trick she had in washing it that she could make it grow, so the same sweater I wore at 5 I probably wore at 14. A year before Mom made me the scarf, I went to visit her in Florida. She told me the surprise project she was working on, a new fisherman sweater for me. She had the back and the side completed, hanging in the closet, and she wanted me to try it on so she knew how much she would need to close it off. Oh, how we laughed at how off were her estimates of my size, it was no where near something I could possible wear. Well not in this century. I am not sure if she finished the sweater and gave it to someone else (smaller) or if she re-purposed it, But it was not long before I got this scarf in the mail. This object, this thing of woven yarn, just became that more special, her love embracing me daily. I miss you so much, Mom. Sometimes in the rush of things, I briefly lose track… and then it just jabs me again. It’s a playful jab, as much as those laughter filled phone calls I remember. You have changed your blog design? I like the “zoom animation” of the image and I can read the text without my glasses now. At the moment I try to get some woolen socks ready. You can not buy them, except you pay someone knitting them. I hope I will manage one pair this year. Pullovers are a big project. I started some, but never finished them. 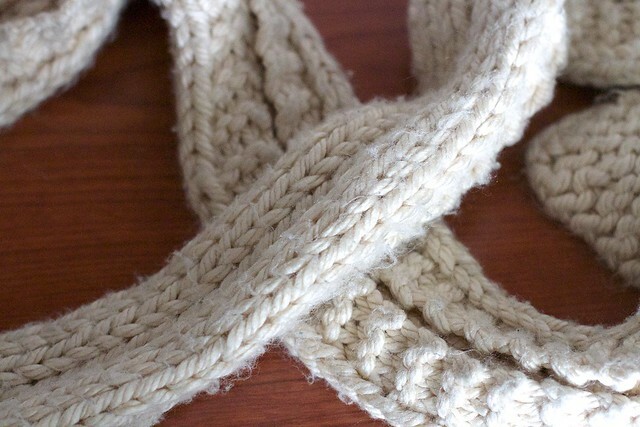 A scarf you could knit yourself. It is one of the things a beginner in knitting can do and by that practicing patience. (Can you buy knitting materials in the US?) But the love for you, knitted into the scarf from your mom certainly remains unique. My mom knitted a lot of things for me, one of the few ways she were able to give her love (apart from preparing herb teas for our well being). I actually found the knitted clothes always a bit “uncool” as a kid, but I now would like having a scarf from my mom. Yes I am in the middle of changing my blogs design it will be changing somewhat as I try new things. You really cannot purchase wool socks in Germany? They are plentiful here, shall I mail you some? I have a very thick pair of black wool ones from the sheep my friends in Colorado own. It’s also easy to get knitting supplies here; I’ve never tried hard to learn. I gave the needles my mom left to a friend who teaches knitting. I guess we have more here we should appreciate. Stay warm! I think this year you have to stay warmer than I. I have heard Canada is very frosty in winter. I gave the original fisherman sweater that Mom made for Dad to my son-in-law Bill. I hope he’s making good use of it in Colorado! That reminds me so much of a poem my aunt sent me about knitted mittens. There is something terribly poignant about unraveling memory. No it is not a scarf. Ahhhhh but it is so warm and comforting. Lovely post Alan. You have captured the essence of knitting IMHO – an act of love by the knitter to keep the loved one warm – physically and emotionally. You mention that you got the scarf after you both realised that the sweater was going to be too small. She may have ‘frogged’ the sweater ( unravelled it) to make the scarf – it’s reuse by knitters. My own mother told me of WWII reuse of sweaters where old ones were frogged (discarding worn areas like elbows) to make smaller garments – sleeveless sweaters for example. 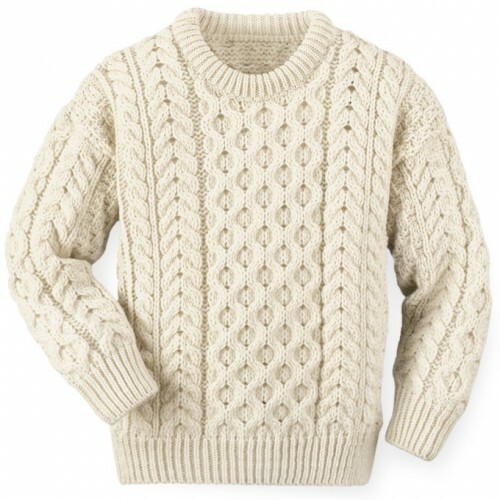 Your story about the sweater grew with you made me think about something I just learned last week. Knitting techniques go beyond needles and stitching. There is a technique called blocking that allows knitting to be reshaped when damp or steamed – maybe that’s how your mother ‘grew’ your sweater. Apologies for the length of this comment (please take it as a compliment :). I also wanted to mention the cultural status of knitting. On ebay and etsy, hand knitting seems to achieve prices that cannot recompense the labour of the knitting. This seems to contrast with Scandinavian cultures (where children learn to knit) where there is a market with consumers who value the labour of knitting and are prepared to pay a fair price. Please do me a favor: Never apologize for a long comment! It’s a joy to see something come in that’s not spam and even more when it contains connections and ideas. I am fairly sure my Mom blocked, I recall her using that as a descriptor of her technique. It reminds me that when I was really young she had a regular routine of going to a “knit shop” where she knitted and gabbed with others, very much I would imagine the precursors to social networking. I did take some of her needles when we cleaned out her house; I gave them to a friend who runs a shop in a town near me. I became super aware, and in awe, of knitters at the early Northern Voice conference, where the knitting bloggers were a strong presence; there too they were way ahead of educators in terms of blogging, online sharing, networking. I think knitters in general and Ravelry in particular could teach educators a lot about online learning. I had massive fun researching and writing an article about Ravelry for Lifewide Learning magazine. That is a bit difficult to find so I republished here https://francesbell.wordpress.com/2014/06/21/ravelry-a-knitting-community-as-a-site-of-joy-and-learning/ It’s worth looking at for the pier art alone.